By 1822, when Frankenstein opened on the London stage, Mary Shelley had lost three children and their father, Percy Bysshe Shelley, who had drowned off the coast of Italy. She'd written three novels, one nonfiction travelogue, and numerous stories. She returned to London from Italy in 1823 to find herself a respected author, and made her way with her one surviving child, as a single mother and a writer until her death in 1851. Mary Shelley never knew her own mother, Mary Wollstonecraft, who died of complications eleven days after her birth. And when she ran off with Percy Bysshe Shelley, her behavior was so scandalous that her adored father, the radical philosopher and political leftist, William Godwin, refused her entrance to his house and contact with her only sibling, her half-sister, Fanny, who ultimately committed suicide. Mary was passionate, but also reserved and often melancholy. She was brilliant, beautiful, and had a keen command of language. She was a reluctant solitary, often shut away from those she loved. Altogether, she wrote seven novels, two travelogues, a mythological stage drama, and dozens of stories, articles, and biographical sketches. She preserved Shelley’s memory, collecting, editing and publishing his poetry, establishing his place in literary history. 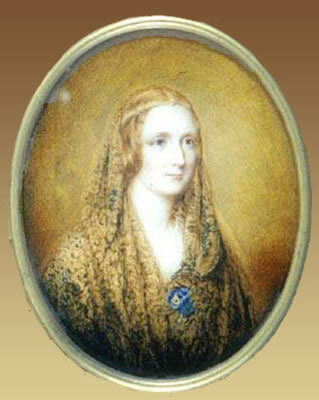 She also contributed to Byron’s legacy assisting anonymously in the writing of Thomas Moore's official biography. It's been 190 years since the publication of Frankenstein, and for most of those 190 years the author of Frankenstein has been unknown and underappreciated. When I first began researching Mary Shelley in the early 1990s, if she was mentioned at all, it was usually disparagingly by academia. Little was known of her actual story, and even to this day, her true legacy remains underappreciated. Her best novel, Valperga, for example, is virtually unknown. Virginia Woolf made an important observation in the 1920's: that women writers need to recover their history. That observation shapes Requiem and drives the present day character, Anna Trevor. When Virginia Woolf delivered her famous lecture about Shakespeare’s Sister, she pointed out that without a history, a true female literary genius cannot emerge, because genius at the level of Shakespeare is a collective phenomenon requiring contact with the past.